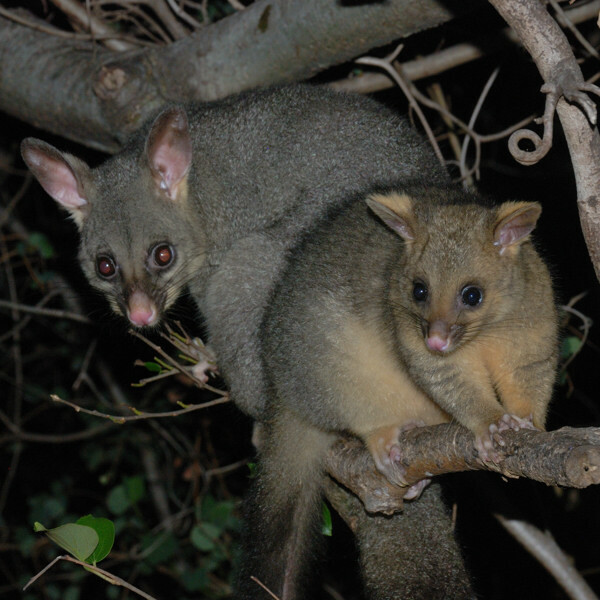 Comet is starting to reach the next stage in the education of a young possum; the stage where the mother possum no longer tolerates having food snatched out of her mouth, and chases off the youngster instead. So far he's been chased off only once (that I've seen), but his days of grabbing food are severely numbered. On this subject, it seems that it's normal for baby possums to learn what's edible by sharing their mother's food; usually by tearing a piece out of her mouth or snatching it from her hands. It's not unusual that if you offer a baby possum an unfamiliar piece of food they will ignore it completely, but as soon as you give a piece to their mother they will seek it out hungrily. Despite the fact that Comet was particularly adventurous from a very young age, he was still just as cautious about new foods as any other baby. Amongst other foods, he initially completely rejected luxuries such as sweetcorn and mango, but instantly took to them the moment Kiki showed him they were genuine food. Sweetcorn is now a particular favourite, and when handed a piece, he usually runs off, holding it aloft in his mouth like a trophy. Tilda has now started visiting fairly regularly. She was given a second treatment of Ivermectin on the tail. Her tail still has bald patches, but the skin (as far as I can see) looks clean and healthy. 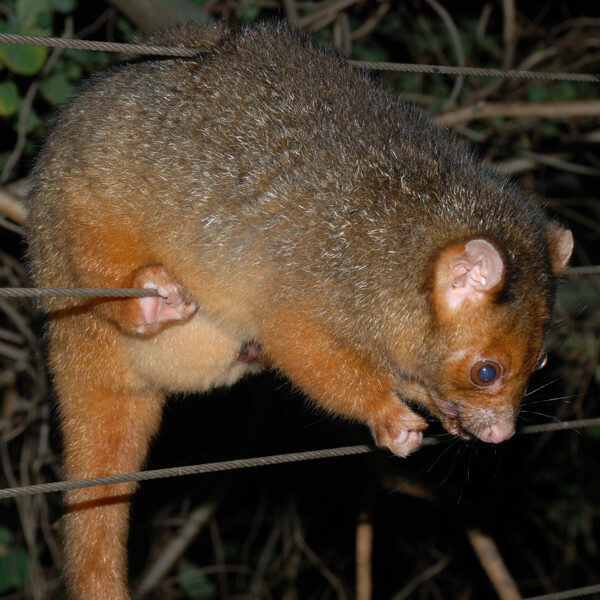 Tilda has babies (I am assuming there's more than one because ringtails usually have twins, and triplets are not uncommon) in the pouch. It'll be interesting when they start back-riding. Wasabi hasn't been seen since about the time of the last blog post. Although Wasabi has a history of going away like this, I'm always a little worried because there are so many dangers in the area. There haven't been any pythons seen yet, but it's been fairly warm for a while and most likely they're around. No possum has slept in any of the boxes for over a month now, so it could be the possums are avoiding them due to snake danger, although it's not clear where else in the area they could sleep that would be very much safer. Dexter hasn't been seen for at least a couple of months and may have left the area, but it's difficult to be sure with him because, except when chasing after Kiki, he usually keeps to himself. Prok is around, but still avoids humans. Usually all that's seen of him is the white tip on his tail disappearing into the trees.